It’s like someone just handed you a guilt trip right through the phone. As a mom, I’ve really tried to deal with my guilt. I always felt like it would really be best for the kids if I stayed home, but I couldn’t afford it. I’ve slogged through life with my kids in one hand and my guilt in the other, and needed several more hands for cooking, cleaning, grocery shopping, and maybe stealing a little time to read. Or, heaven forbid, sleep. For awhile I lived as a single mother. I worked late many nights, and by the time I got the kids picked up and back home there just wasn’t enough time for everything. I didn’t teach my babies sign language. They never went to pre-K because the schedule didn’t jive with my work hours. Violet absolutely refused to get a head start on numbers or letters before school started. My youngest just started kindergarten, which is what got me thinking about all this, about all those other mothers who stayed home with their kids and gave them such an advantage over my poor children. Claire is the youngest of three, which means she has always just been part of the chaos of a big family instead of a brilliant youngster with a dedicated mother. Would she be behind? Would she suffer? Then I got her test results from the beginning of the year. You see those blue dots? Those blue dots are my child. MY child, who’s pre-school education mostly included a lot of Mickey Mouse Clubhouse while I was getting ready in the morning. You see that dot? The one so far up there that it’s almost off the chart? That dot means that I’m not a bad mom. That dot means that somewhere along the lines I did something right. That dot means that the weekend trips to the library and the discussions in the car about everything we saw around us actually meant something. That dot means that I don’t have to feel so guilty. And neither, fellow working mother, do you. I am so thankful that my daughter loves me enough to write me this letter, and have it waiting for me when I got home last night. 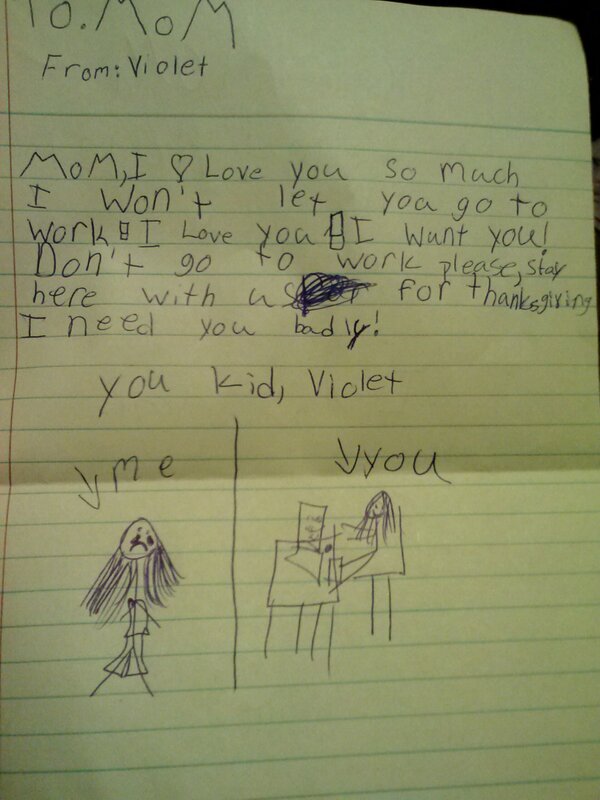 I am thankful that I could give her a hug and tell her I wouldn’t be working on Thanksgiving.